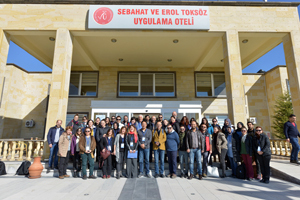 As part of the above-mentioned program commissioned by the Agency for Cultural Affairs, we visited Turkish universities which have cultural property conservation and restoration courses to survey their educational systems from November 4th to 9th, 2018. 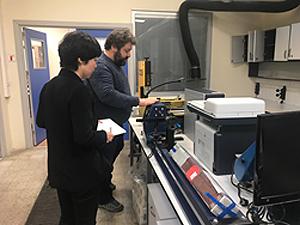 For FY 2018, we made visits to the Department of Cultural Heritage Conservation and Restoration, the Faculty of Fine Arts, Ankara University, and the Department of Conservation and Restoration of Movable Cultural Assets, the Faculty of Letters, Istanbul University, in addition to the Department of Conservation and Restoration of Cultural Properties, the Faculty of Fine Arts, Ankara Hacı Bayram Veli University (former Gazi University) which has been cooperating in the key training program of this project, “Examination and Implementation of Emergency Procedures for Wall Painting Conservation.” At each university, faculty members delivered a presentation on teaching programs restoration techniques together with briefing on educational facilities. We also tried to clarify and share the current educational issues associated with conservation of cultural properties through opinion exchanges. Taking advantage of its merits as a university organization, every university endeavored to solve facility and human resource shortages by promoting joint projects with another course and a local government concerned. 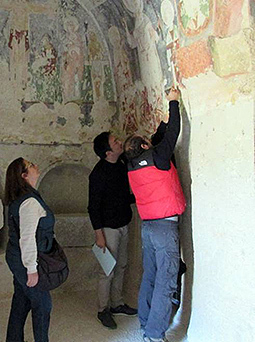 The faculty members of each university were experts who had been technically trained for conservation and restoration of cultural properties in the western countries and Europe regardless of their training periods. 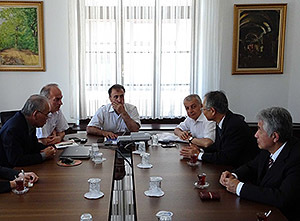 On the other hand, we found that it would be essential to reinforce their educational systems further for diverse cultural properties in need scattered throughout Turkey. 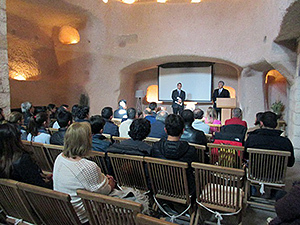 Many of the graduates from these universities are now working for the national conservation and restoration centers, to which the trainees of the mural painting conservation program belong. The outcomes of this survey will be utilized for our deeper understanding of their educational backgrounds. 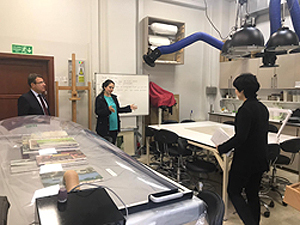 From October 29th through November 14th, 2016, the Japan Center for International Cooperation in Conservation held a meeting to exchange views and opinions on the conservation of and management system for mural paintings and conducted an inspection tour in the Republic of Turkey. 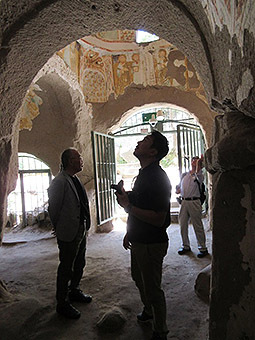 The meeting took place, targeting administrative officials in charge of conserving mural paintings in the country, conservation and restoration specialists, educators and university students, at three venues, namely, the Ministry of Culture and Tourism, the Faculty of Art and Design, Gazi University in Ankara, and the Argos Hotel in Cappadocia. 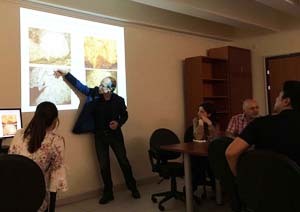 Through a presentation on a training program associated with the conservation and management of the mural paintings of cave churches of Cappadocia planned by the Center, we were able to identify participants’ needs firsthand and obtain valuable information that will be helpful in developing projects in the future. 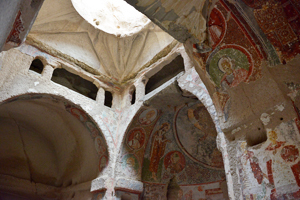 Meanwhile, the inspection tour covered cave churches scattered about the Goreme district in Cappadocia, cave churches in Ihlara Valley, Çatalhöyük, the Antalya Museum, St. Nicholas Church in Demre, and the ruins of Ephesus, under the cooperation of the Nevsehir Conservation and Restoration Center and the Conservation and Restoration Department, Faculty of Art and Design, Gazi University. 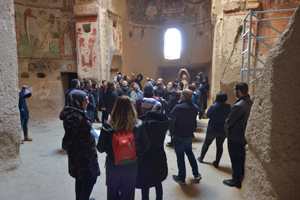 This tour allowed us to deepen our understanding of the actual situation of maintaining and managing a wide variety of mural paintings in this nation. We will continue to conduct similar surveys, identifying points to be improved and new issues so as to translate them into new future projects.